This is the slot that started it all, the slot that gave online slot developer Microgaming a real hit and the slot that was the catalyst for numerous other slot releases under the Untamed series. 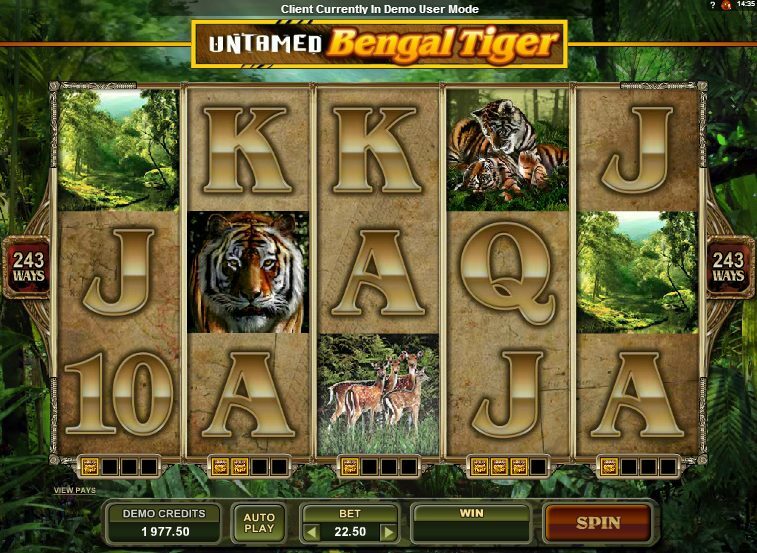 Untamed Bengal Tiger is a 5 reel, 243 ways to win slot that is set in the jungle and, unsurprisingly, has a large amount of focus on the Bengal tiger. The symbols consist of the Bengal tiger staring, the Bengal tiger playing, a Bengal tiger’s eye close up and some deer. Before we get into the nitty gritty of this slot, there are some special features we need to cover. Firstly, there is the Lucky Nudge. There is a chance that the Bengal Tiger’s eye Scatter may automatically nudge from above or below the reels to trigger the free spins bonus round. You should also keep an eye on the Collect a Wild feature. Every time a Wild appears on one of the five reels then it will be added to the collection of Wilds below that reel. If you collect four Wild symbols below a reel then you will turn that entire reel Wild for up to four spins and be able to trigger some big wins. It is possible to turn more than one reel completely Wild at the same time. There is also the ability to alter your gambling odds with the Your Gamble feature. By adjusting your odds, it is possible for you to bank up to half your winnings on this slot game. Now, onto the other features. 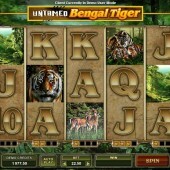 The free spins bonus round is triggered if you hit three or more of the Bengal Tiger’s eye Scatters across the reels. As mentioned above, you could be lucky and have one automatically nudge up or down onto the reels. In the free spins bonus round, you will be awarded with 20 free spins. In a slight twist, during the free spins the Wild symbols become Trailing Wilds and it will expand to two spaces on the reels before covering the whole reel. Untamed Bengal Tiger is a fascinating game with the amount of action the Wilds bring to the game. It is easy to see why it has become such a popular slot with players and it is easy to see why it has spawned other Untamed series slots such as the sequel Untamed Giant Panda and equally mesmerizing Untamed Wolf Pack. I can only advise you to give this slot a try. It was the inspiration behind further slots releases and you can then see what all the fuss is about. The only downside is that the wins happen quite frequently but are not the biggest. On the flip side, it does mean there is a lot of action and intensity.